Turnberry Towers Las Vegas is near construction completion for 2nd tower of its luxury condominiums. 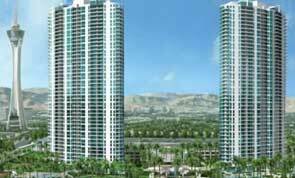 Turnberry Towers condos are located in two 45 story towers. Turnberry Associates is the real estate developer, also built Turnberry Place Las Vegas, NV and the new Fontainebleau luxury condos on the Strip. Fontainebleau will be a casino, condo and hotel project. Turnberry Towers Las Vegas high rise condos include luxury amenities as residential vallet, Smart Home technology and 3,800 square foot lagoon pools, each Turnberry Tower will have its on pool area with a heated spa, sandy beach entry, waterfalls flowing 15 feet over a grotto and a shallow wet deck. Attanasio Landscape Architecture Attanasio is developing the Las Vegas resort style pools. The Turnberry Towers pools will be resort-style with free form shapes and surrounding casual benches. The company has been working with the high-rise real estate developer for seven years. There will be several entry point for the lagoon pools and a shallow wet with cool sparkling water. Turnberry Towers East Tower will be completed in June along with the first pool. Turnberry Towers Las Vegas high rise condos by Turnberry Ltd., the same company who is building The Signature MGM Grand Residences and Town Square Las Vegas, is under construction on 10 acres of Las Vegas land at the corner Karen Avenue and Paradise Road. The Turnberry Towers east tower is expecting to see its first residents June 2007. Turnberry Towers real estate in Las Vegas, Nevada is located near the Las Vegas Strip and several new Las Vegas condos developments, including Allure Las Vegas, Echelon Place and Palazzo Las Vegas within the next few years. These developments will energize the north end of the Strip. Las Vegas luxury homes for sale at Turnberry Towers prices range from $550,000 to more than $1.3 million. Several Turnberry condos for sale remain in the east tower, and the Turnberry Towers west has less than 40 percent remaining with an expected completion in mid-2008. 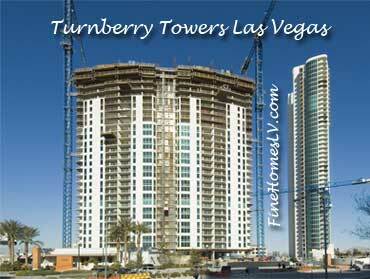 Turnberry Towers Las Vegas real estate continue brisk sales of Turnberry homes for sale in Las Vegas. There are less than 150 Turnberry Towers residences remaining. Turnberry Towers Las Vegas condos are a dual 45-story condominium development one block from the Strip. These Las Vegas luxury condos for sale are attracting many second and vacation home buyers. Architecturally designed by Robert M. Swedroe Architects and Planners, each tower within the gated property will comprise 318 Las Vegas luxury condominium homes, with one to three bedrooms. All of the Turnberry Towers real estate homes feature intercom technology for concierge and valet services. Resident amenities in each Turnberry Towers luxury condo include a fitness facility, valet, landscaping, outdoor pool with sun deck, tennis court and 24-hour security.